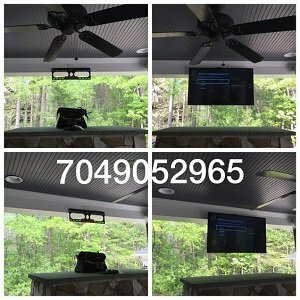 In North and South Carolina, we have several months of enjoyable outdoor weather during the year which allow for outdoor TV mounting. What could make a better Sunday than watching your favorite football team with family or friends while enjoying the beverage of your choice and sitting outside enjoying the weather? Our outdoor TV mounting services make this dream come true. 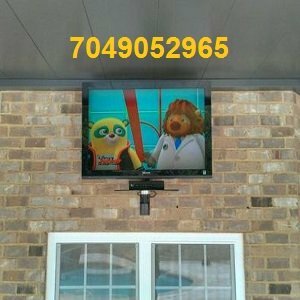 Over the years we have seen outdoor TVs change from very expensive to affordable retrofit kits that weatherproof regular indoor TVs. Outdoor TVs usually come enclosed in a heavy casing as opposed to lightweight retro kits. Whether you invest thousands in an outdoor TV or hundreds in a retrofit kit, our outdoor TV mounting service will amaze you. Our installers offer years of experience and personal focus on your project. We have extensive experience in installing outdoor TVs and know exactly what it takes to complete that perfect outdoor home theater experience for you. Many of our commercial customers have even used our outdoor TV mounting services to create outdoor TV walls and high-energy sports environments for their customers. Bars and many venues in the uptown Charlotte area recognize the importance of hanging outdoor TVs and providing entertainment for their outdoor customers. Don’t worry about the surface of the building or wall that the TV will be installed on. All you have to do is purchase the TV, get a quote, and schedule an appointment. We will take care of the rest. Stone fireplaces, brick and concrete walls, vinyl siding, and wooden siding, are just a few of the surfaces we can tackle. 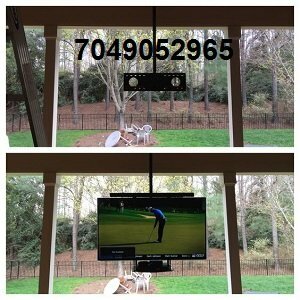 We have various ways to conceal wiring for outdoor TVs depending on the surface the TV is mounted on. Before you commit to our outdoor TV installation services, make sure your TV is weatherproof. If you want to mount a regular indoor TV outdoors, we strongly suggest using an outdoor TV cover to reduce moisture. 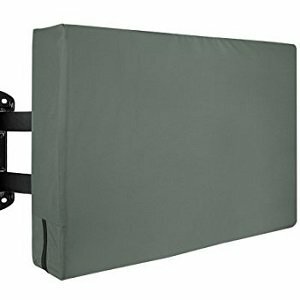 You can purchase a TV cover or TV jacket like the one below for any size TV from 32 to 65 inches on Amazon.